The Pauling Oxygen Meter. approx. 1940. On October 3, 1940, Pauling met with his colleague, W.K. Lewis, in New York City. At this meeting Lewis informed Pauling that the military needed an instrument capable of measuring the pressure of oxygen in a mix of gases. He explained that soldiers operating in low-oxygen environments – primarily airplanes and submarines – were sometimes affected by loss of consciousness and even death due to unchecked oxygen depletion. An oxygen meter would enable pilots and submariners to track oxygen levels within the cabin, allowing them to adjust for dangerous decreases. The following day, Pauling began mentally sketching out plans for the instrument and before long he had struck on a possible design. On October 8, he sent a telegram to National Defense Research Committee (NDRC) administrator James Conant stating that he had a “most promising” means of determining the partial pressure of oxygen. Soon after, Pauling received an unofficial order from Harris M. Chadwell, Conant’s right hand man, to begin experimenting with the design. After another exchange of letters, Pauling was appointed “official investigator” for the project and given a budget which funded Pauling and his colleague Reuben Wood, a temporary assistant, with materials and equipment for a six-month probationary period. Torsion balance used in the Pauling oxygen meter. approx. 1945. The apparatus was based on the principle of a torsion balance, a measuring device originally developed by Charles-Augustin de Coulomb in 1777. Wood created the balance by connecting a tiny metal bar to a quartz fiber. He then attached a hollow glass sphere to each end of the bar and a mirror to the fiber crossbar. The entire device was then strung between the points of a standard horseshoe magnet and shielded by a bell jar. When the spheres were filled with air, the paramagnetic forces present in oxygen atoms would cause the dumbbell setup to rotate, twisting the quartz fiber. The mirror on the fiber, as it twisted, would alter the angle of a reflected light beam, striking a photocell. The photocell readings would then register on a dial, in the process giving an approximate measure of present oxygen levels. By November 1, less than a month after receiving the assignment, Pauling and Wood had constructed and tested a model. Though fragile and prone to decalibration, it worked. After presenting his and Wood’s work to government officials, Pauling was told that the meter would need to be usable despite frequent acceleration and deceleration, tilting on all axes, and constant shock and vibration. In response, the duo designed an adjustable support for the apparatus which allowed it to remain stable despite movement and shock. Shielding and damping techniques were developed too, allowing the meter to give accurate readings under moderate strain from outside forces. There were, of course, setbacks. The quartz fibers were nearly invisible and required special tools to create and place. The glass bubbles used on the instrument had to be hand-blown but were so delicate that it took many tries – sometimes hundreds – to create a single perfect bulb. Supplies, too, were difficult to acquire. Liquids for damping, metals, and magnets all proved hard to find, further slowing the research process. Though development was cumbersome and sometimes frustrating, it was clear by the summer of 1941 that Pauling’s oxygen meter was a success. The NDRC, pleased with Pauling’s work, renewed his contract, requesting that five additional meters be manufactured and distributed according to committee orders. Despite the production demands placed on his team, Pauling insisted that the design be further improved. Wood suggested a prototype using two magnets rather than one – a new approach which allowed for a sturdier, more accurate model. Reuben E. Wood. March 1948. 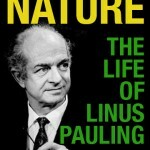 Despite the creation of the Office of Scientific Research and Development, an entirely new war research agency, and major changes in hierarchy and administrative procedure, Pauling’s group worked for seven months manufacturing oxygen meters with little interference from officials. By early 1942, it was clear that his team could not keep up with growing demand for the device. 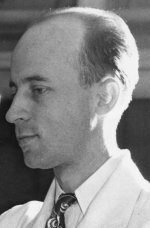 In response, Pauling turned to Caltech staff member Dr. Arnold O. Beckman, a skilled instrument-maker who, after a meeting with Pauling, accepted a contract with Caltech for the manufacture and distribution of the oxygen meter. 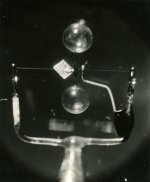 To simplify the production process, Beckman built the world’s smallest glass-blowing device for purposes of creating the meter’s bulbs. 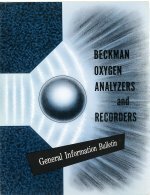 Through this and a few other innovations, Beckman increased his manufacturing capacity to nearly one-hundred units monthly – at least ten times what Pauling’s team could have hoped to achieve. 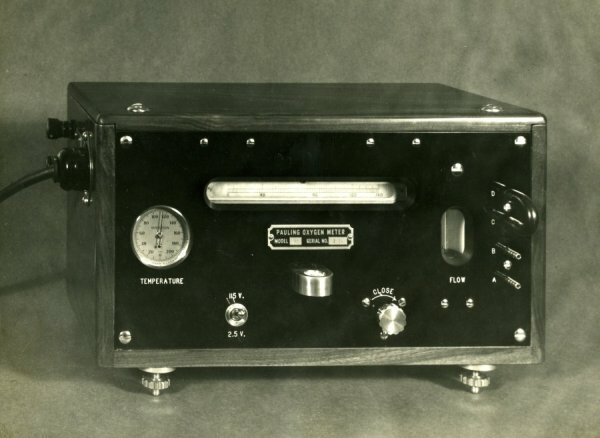 For the remainder of the war, Pauling continued to oversee the production and distribution of the oxygen meter and Beckman, with his refined manufacturing process, succeeded in equipping Allied forces with hundreds of the devices. Customized models were also provided to laboratories and government institutions in both the U.S. and abroad, and were instrumental in the development of life-support systems for both pilots and submariners. The use of Pauling’s oxygen meter did not end with the war. Following the close of hostilities, the meter was repurposed for the incubators used to house and protect premature infants. Hospital staffs were now able to maintain safe oxygen levels, reducing the risk of brain damage and death among newborns. Pauling was proud of his instrument’s peacetime applications and occasionally noted it as one of his more significant accomplishments.